Sheila Ong Ching would be described in a fairytale story as the fairest of them all. She has luminous, flawless skin and a beauty that is on the same calibre as movie stars and models of beauty products. Instead of being a lady of leisure, she decided to pursue her entrepreneurial dreams which resulted in the birth of the first Skin Perfect Aesthetic Salon on October 7, 2000 in Quezon City. Today, they have branches nationwide and have continued to maintain its high quality standards. With an advocacy of promoting beauty through skin care and other body treatments, Skin Perfect takes on a spa-care oriented approach in making people understand their skin problems and the solutions available to them while they are being pampered in a relaxing ambience. Skin Perfect anchors its main thrust on providing sustainable and quality skin care through the latest technological advancements and treatments known in dermatology. Its inclination towards the use of non-invasive treatments provides for the safety and comfort of its clients. On its 13th year anniversary, Skin Perfect went all out in their celebration and invited their clients to try their latest non- invasive treatments like facial skin tightening (Radio Frequency and Intense Pulse Light), non surgical eyebag removal through mild current/galvanic method, chemical peeling, anti wrinkle treatment, and the list goes on. 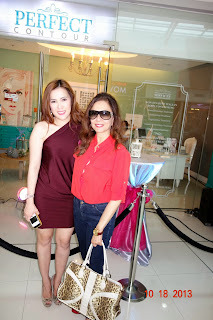 Sheila Ann Ong launched three aesthetic branches at Magnolia Robinson Mall -Skin Perfect, Perfect Contour specializing on body contouring as the name suggests and Vanity Circle Salon specializing on hair treatments and nails. I opted to have an extensive facial treatment coupled with their non- invasive eyebag removal treatment and in all sincerity, I can say that my eyebags improved considerably. However just like all non- invasive treatments, one has to repeat the treatments at least every few weeks until optimal results are obtained. I was tempted to do a body contour treatment but unfortunately I did not have the luxury of time. Perfect Contour caters to those who are looking for fast and effective non-surgical alternatives to slimming and beauty enhancement. Its state of the art facilities intend to take care of the clients’ safety and treatment effectively. It specializes on non-invasive body contouring treatments that are specifically designed to safely facilitate fat reduction and muscle toning therefore sculpting the body to its ideal silhouette. Gift yourself this holiday season with a low- cost pampering program at Sheila Ong's one stop Aesthetic Salons as all three are located on the 3rd floor of Robinson Magnolia Mall In Corner N. Domingo Street and Aurora Blvd., Quezon City.